The popular holiday resort town of Roquetas de Mar, one of the major resorts in Costa de Almeria, was once a sleepy, picturesque fishing village, dating from Roman times, and it still retains its warren of Moorish alley-like streets and pretty aspect of white-washed houses ascending the hillside. Hotel and apartment complexes, however, are beginning to dominate the skyline especially along the long, sandy beaches adjacent to the village. Tourism is big business along the holiday strip in Roquetas de Mar, with shops selling local crafts jostling with numerous restaurants and bars, and myriad activities on offer from horse riding to scuba diving or sailing. Roquetas has an 18-hole golf course (at Playa Serena), a bull ring and a specially designated nudist beach. Those interested in history will enjoy exploring the ruins of the medieval Castilla de Santa Ana and other fortifications in the area, and bird-watchers have a treat in store at the Las Marinas salt marsh and Punta Entinas beaches a few miles south of the village, where flamingos, egrets and avocets gather. The resort is popular with both Spanish and foreign tourists and the spacious beaches ensure that it feels less over-crowded than many other Spanish beach resorts. Shopping in Roquetas is aimed at tourists, with the usual souvenir options like postcards, t-shirts, and beachwear. There are a few markets worth visiting, particularly the Thursday open-air market. Costa de Almeria is known for its fresh produce and seafood, and the port of Roquetas de Mar receives its fresh catch every morning. You'll find many great seafood restaurants and tapas bars on the promenade. There are a variety of international restaurants to suit tourists' tastes, but a great way to sample local cuisine is at one of the many tapas restaurants. British and American staples are easily found and the selection of restaurants should be more than sufficient for all tastes. There isn't much of a nightclub culture in Roquetas de Mar, but the hotels offer a variety of entertainment for a low-key night out, including live music and shows. The Teatro Auditorio hosts classical music and dance performances. A few hotels have their own discotheques, including the dancing rooms at the Sabinal and Zoraida hotels. The Bull Ring also offers live entertainment. M25 is a popular British themed sports pub for tourists. Aside from the lovely beaches in Roquetas, there are interesting architectural and historical sites to visit, including the Our Lady of the Rosary Church and the Santa Ana Castle, as well as Roman ruins at the Torrequebrada archeological site. 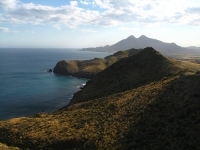 There are many scenic spots in the nearby reserves, including Punta de Entinas Sabinar Natural Park and Cabo de Gata Natural Park. Roquetas de Mar is also conveniently close to Almeria, which is worth a daytrip when holidaymakers get tired of the sun, sea and sand. Roquetas hosts a number of festivals throughout the year, including the Three Wise Men Parade in January, the Night of San Juan in June, and the Moragas in December. Jellyfish tend to visit the shores of Roquetas de Mar which can make swimming and water activities difficult; the town has tried to put buoys and netting up to stop the jellyfish but tourists should still take precautions. Entertainment and nightlife is very low key.